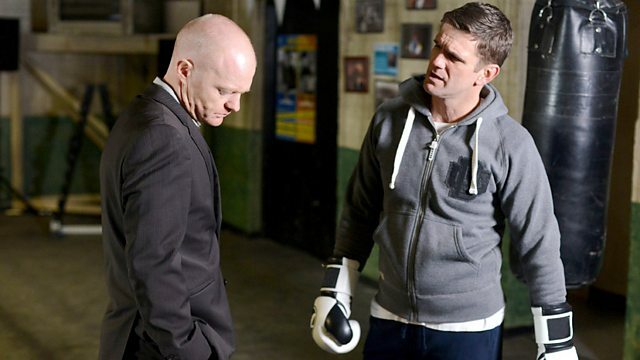 Jack and Max come up with a plan to stop Kirsty's past from catching up with her. Tanya is left devastated when Lauren's lies and drunken behaviour start to spiral out of control. Tanya suspects Lauren of sneaking in alcohol but it turns out to be surprise breakfast ingredients. Lauren snaps when Tanya mentions Joey. After a lecture from Cora, Lauren tries to make amends, calling round to Booty with cake and her finished college essay. While helping at Booty, Lauren’s upset when Whitney books a manicure for a night out with Lucy then tells Tanya she’s seeing her course-mate, Hannah, for dinner. Pleased, Tanya gives Lauren cash for a treat. Later, Patrick finds Lauren downing wine in Jim’s shed in the allotments. Lauren bemoans she has no friends and is still in love with Joey. Patrick advises she talk to Tanya. Returning home, Lauren reveals the truth, admitting she made Hannah up. Tanya’s astounded. Fed up, Lauren downs a whiskey. Tanya’s horrified – why is she doing this? Lauren defiantly declares she’ll continue to drink and Tanya can’t stop her. Max calls Adam to make him back off but Adam hangs up. Max and Jack pay Adam a visit; Jack floors Adam and the brothers warn him to leave Kirsty alone. Kirsty’s horrified. Max cuts up Kirsty’s mobile sim card, repeating his vow to protect her. Ray’s spent the last three nights at the B&B with Kim running his errands. Patrick worries Ray’s taking advantage of Kim, but she’s delighted they’re back together. After a day spent juggling the Vic and a poorly Sasha, Ray quits his job – he’s moving to be nearer Sasha. Kim informs Ray she’ll go with him. Sharon’s living at the B&B. Jack offers her his flat but she declines. Sharon hints she and Dennis could move back in now Lexi’s gone but Phil refuses – nothing’s changed. When church warden Brenda Roberts is dismissed for stealing from the collection plate, Poppy and Fatboy urge Dot to apply for the post.